Can You Still Retire If You Got Less From FERS? Many employees are concerned about being able to retire comfortably if their pension is changed. We all know how frustrating it is to spend years counting on something that may end up being less than expected. When we hear that Congress may try to change FERS, we start to wonder if retirement will still be as good as we hoped. But what if the problem wasn’t if FERS changed? What if the problem was the way we understood the benefits? The problem is simple. 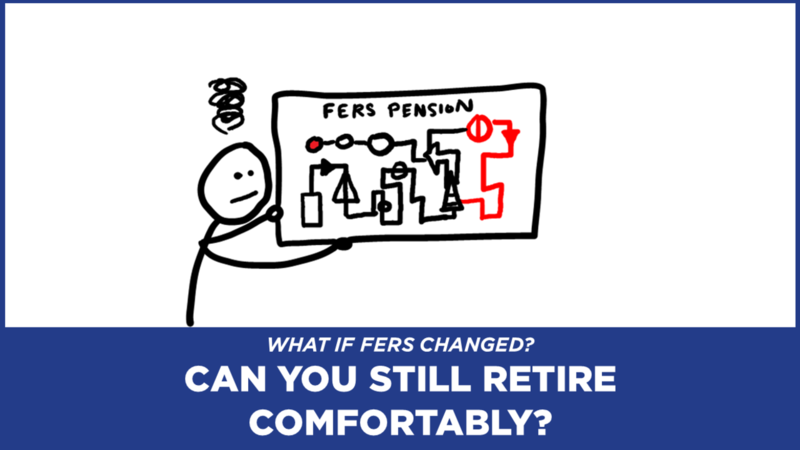 A lot of people struggle to understand how the pension benefit works and hearing about possible changes is stressful, but how many know how to calculate FERS? How many pre-retirees have estimated what they’ll get each month at retirement? This problem is made worse when people wait until they’re close to retirement to get an estimate from HR. The solution is knowledge. Draw a triangle, a circle and a square. Under the triangle, write Creditable Service. Under the circle, write Pension Factor. Under the square, write High 3 Average. Put an X as shown below in the picture. This is how your FERS pension is calculated! OPM multiplies your Creditable Service, Pension Factor and High 3 Average. If there’s a change in this formula, then you may get less each month in retirement. CREDITABLE SERVICE has three parts that are added together for your pension. You’ll receive credit for the years, months and days. The final tally for your Creditable Service is in years and months. Any days under 30 are dropped from the final service calculation. PENSION FACTOR is a percentage and it’s based upon age and years of service. The years of service used is limited to FERS Service plus Military Service with deposit. Unused sick leave cannot be used for pension factor. 1% Pension Factor. Use this factor if you retire UNDER age 62 OR at any age with less than 20 years of service. 1.1% Pension Factor. Use this factor ONLY if you retire at age 62 or older AND have 20 years of service or more. FERS Special Provisions use a separate Pension Factor which can be found here. HIGH 3 AVERAGE is the highest average basic pay you’ve earned during any 36-consecutive month period of FERS service. Thirty-six months equals 3 years, and that’s why it’s called High 3! These three years are often at the end of your career, but can be an earlier period if your pay was greater. Basic pay includes locality pay. Shift rates apply if retirement deductions are withheld. Overtime and bonus payments are NOT INCLUDED in High 3 Average. Special Provisions High 3 Average includes the basic pay including locality pay and specific premium pay (such as AUO for LEO). Here’s the concern. There’s “talk” in the form of legislation being introduced from time to time that the pension system should be changed, and future retirees should get less. And if, for instance, the High 3 Average were changed to a High 5 Average, your FERS pension could be less. This is because your average base pay would include more prior months, and your High 5 Average may be less than you were expecting. High 3 Average influences how much you’ll get each month in retirement. The higher it is, the more you get! On the flip side, if it’s lowered you’ll get less. CASE STUDY: Can Frannie Still Retire If High 3 Average Changes? Frannie is retiring at age 62 with 30 years of creditable service. Her hypothetical High 3 Average is $58,218. Her hypothetical High 5 Average is $56,506. Frannie’s pension using High 3 Average: $1,600 per month. Frannie’s pension using High 5 Average*: $1,553 per month. That’s $47 less each month that she’d receive, and if she’s counting on that money, it may change her retirement planning. It may even change her TSP savings goal. *Disclaimer: No actual changes to High 3 Average have been passed by law. Hypothetical High 5 Average was estimated within the current definition of High 3 Average but using the highest average basic pay earned in a 60-consecutive month period of FERS service instead of 36 months (a final salary of $60,000 with a 3% prior year annual increase). The key is clarity. We all know how unnerving it is when there’s a risk of having less money than we were counting on. If you’re concerned about being able to retire comfortably, learn how to use all seven FERS benefits so you have a sound retirement plan—making sure that your TSP savings goal is adequate, especially if there are benefits changes. Pick a mock retirement date. Select your Pension Factor that applies to your retirement. Estimate your High 3 Average at retirement. Multiply all three figures together to ESTIMATE your FERS pension. The answer is to build a clear understanding of your benefits so you can plan your retirement, develop an accurate TSP savings goal, and be prepared for potential benefits changes.